Chili Stuffed Acorn Squash ~ for this easy dinner I'm using acorn squash as healthy little bowls for my best chili recipe! Brush the squash halves with one tablespoon of the olive oil and season with salt and pepper. Place face down on a baking sheet and bake for 45 minutes, or until tender. Brown the ground beef in a large heavy bottomed pot, and then remove to a plate. Add the remaining olive oil to the pan and saute the onions and garlic until soft, about 10 minutes. Add the beer to the pot and bring to a boil. Boil for a minute or two to reduce it down a bit, and then add the meat, tomatoes, and spices. Give everything a good stir and bring up to a boil. Turn down the heat and simmer, covered, for about 45 minutes, stirring occasionally. Add the beans and chilies and heat through. Season with salt and pepper to taste. Sprinkle the masa harina into the chili and stir well. Continue to simmer for a few minutes until thickened. Check the seasonings and add salt and pepper to taste. 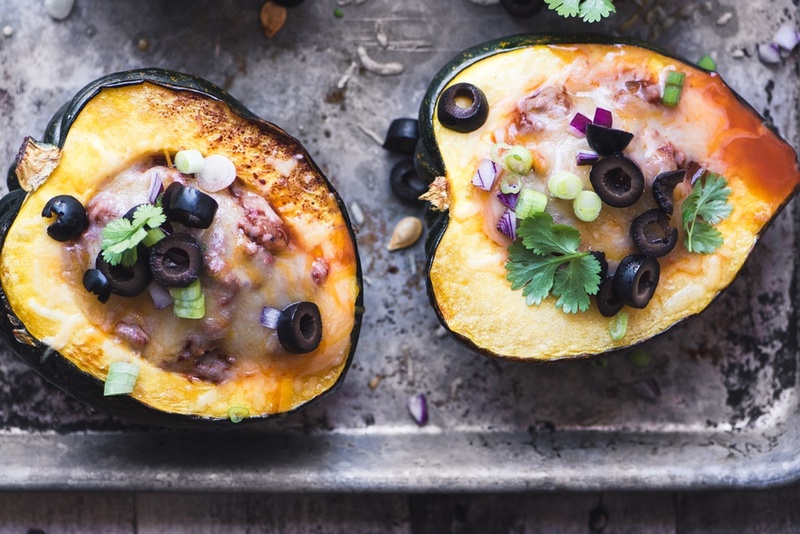 Ladle some chili into each acorn squash half and top with cheese. Put under the broiler until the cheese is melted. Top with garnishes and serve.